If you were to ask a cross-section of New Yorkers what's the single product in existence they'd most like to see dispensed from a 24-Hour ATM, what would be the over/under on the number of people who'd say cupcakes? Has to be 75%, lowball, right? Well, today that nascent dream is a reality, my friends. 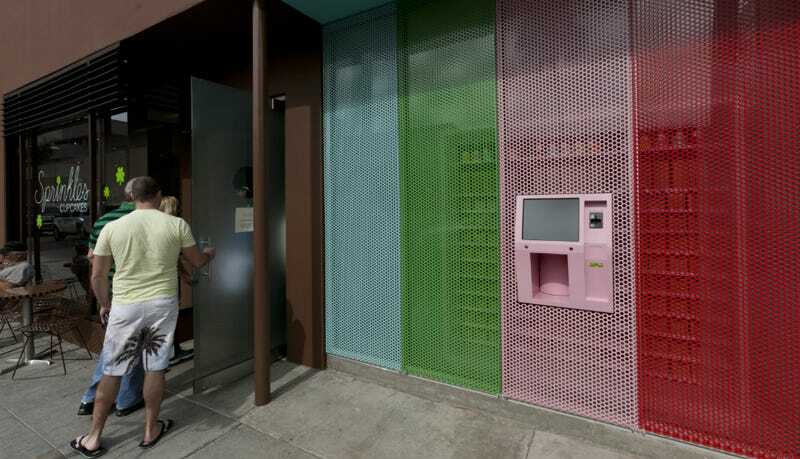 Mary Ann, 65, stopped by Sprinkles in the morning before the machine was up and running two buy two cupcakes, but came back in the afternoon to try out the ATM. She said she makes frequent trips to New York City from North Carolina to look after her friend's dog. "I can look forward to this every time I come back now," said Mary Ann, who declined to give her last name. Boldface mine, because seriously, she was so embarrassed that she refused to give her last name, like she's the Hamburglar of cupcakes or something. Such is the power of the Cupcake ATM.